If I wanted portable (or full size) speakers I would surely want to hear them before I bought them. 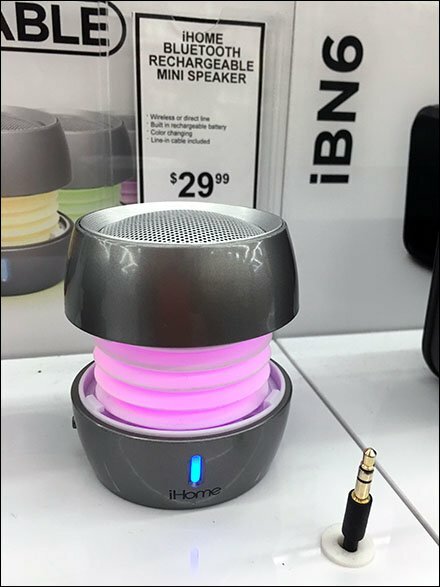 Here iHome (SDI Technologies) offers just such a Portable Speaker Try-Me In-Store across the full range of products … some speakers even including a builtin lightshow. Just pull out the standard size Earphone / Speaker Jack, plug into your iPhone, iPad, iPod, or Droid and listen to songs from your personal library to judge fidelity, base, tremble, and custom lightshow. See the full display via thumbnail, and zoom in on the on-shelf Portable Speaker Try-Me In-Store via gallery of photos.